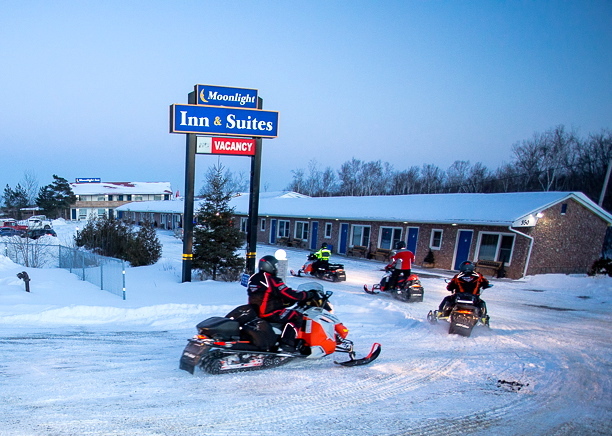 How about staging from Moonlight Inn Sudbury in Northeastern Ontario for your snowmobile tour or snowmobile vacation? As large a city as Sudbury is, there sure aren’t many lodgings with trail access to the door. So your stay overnight options are limited to either periphery towns in the Greater Sudbury Area like Azilda, Lively or Coniston. Or to one of several wilderness lodges in the more remote outskirts. But if you want to stay at a place with a Sudbury, Ontario street address, my favourite is the Moonlight Inn & Suites. If you want to know where to ride from there, check out my Snowmobile Sudbury Article. For those trailering in, this modern motel is located conveniently on the east side of the city, just west of where Kingsway meets the Highway 17 by-pass. It’s almost next door to the Sudbury Royal Distributing store. For those riding in, Moonlight Inn & Suites has a local trail to the door off of TOP Trail D111. The motel is just south of its intersection with TOP D and is well-marked with “Moonlight” trail signs to follow. Either way, if you want to take advantage of some of Sudbury’s “big city” amenities, attractions and nightlife, this is as close as you can get and still be trail accessible next morning. The family owned and operated Moonlight Inn & Suites is friendly, clean, comfortable and affordable. It offers several different updated room styles including some 2-room kitchen suites, great for extended sledding stays. There’s lots of truck and trailer parking on site, with space for sleds in front of most rooms. Plus, there’s a good restaurant right across the road, free Wi-Fi and continental breakfast. 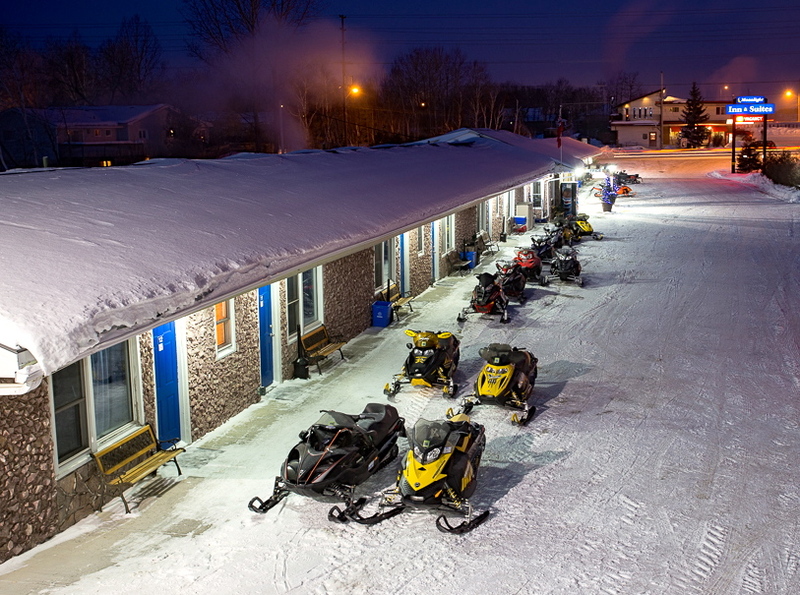 That’s why the Moonlight Inn & Suites is the snowmobiler’s smart choice for a staging hotel to ride the Sudbury area’s four excellent Snow Tours (Cartier Moose Loop, Chiniguchi Wolf Loop, Deer Loop and Rainbow Elk Loop). Or as your gateway motel to ride to other points farther north in Northeastern Ontario. On our last night, the motel was full of sledders using it as a one-night stopover for passing through on a saddlebag tour. Or like we did, you can stay at the Moonlight Inn & Suites on your first and last nights to head east for an extended Ride Around Nipissing. Whatever your choice, you’ll get a good night’s sleep on the comfortable beds at the Moonlight Inn & Suites. Then you’ll be ready to start next day fresh and well-rested for more great trail riding. 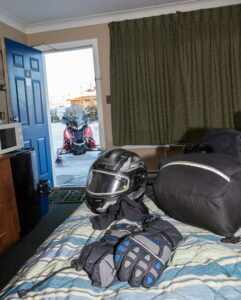 But make reservations in advance so you are sure to get a room at this popular snowmobilers’ motel!